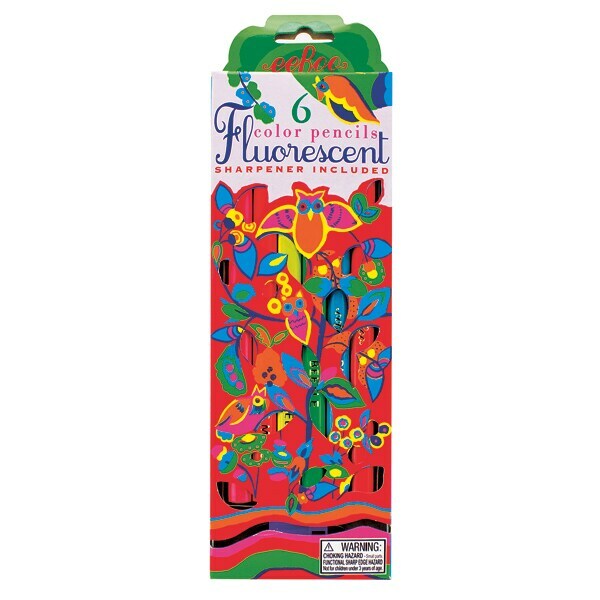 With wide-eyed owls in wild colors on the box, these big fat fluorescent pencils are ready to add plenty of color to your drawings. The six pencils are nearly double the thickness of standard color pencils, with extra-fat cores in 6 colors: Shockingly Pink, Electric Melon, Hello Yellow, Beetle (bright green), Blue Morpheus, and Sunset (an orangey pink). The 7-inch pencils have a slightly triangular shape—making them easier to grip and also less apt to roll away than round pencils—and the set includes a large-point pencil sharpener.